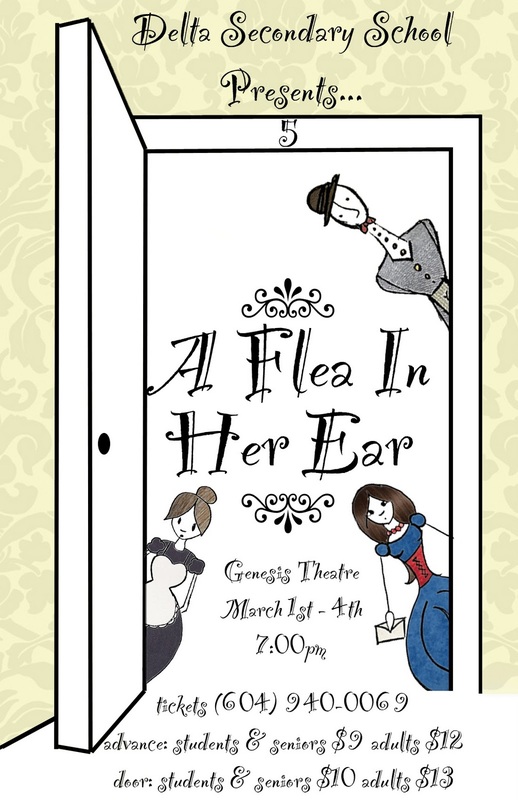 Last week, Delta Secondary School's Theatre Department put on a production of 'A Flea in Her Ear', a French farce set in Paris at the turn of the century. The show, co-directed by Ms. Rebecca Salton and Mr. Mark Lebourdais entertained over 1000 people throughout the four days and provided edge of your seat humour the entire time. Productions of this magnitude do not happen without a team of supportive staff who are working behind the scenes. Thank you to Ms. Heiden, Ms. Collins, Ms. Rogers, Ms. Campbell, Ms. Cruz, Ms. Richter, Ms. Pierce, Ms. Pilling, Mr. McKinnon, Mr. Pelletier, Ms. Bowling, Ms. Shoemaker, Ms. Denz, Mr. Harkley and Ms. Peters for all of your efforts. This year, my experience was very different. Along with my administrator colleagues Mr. Terry Ainge and Ms. Alka Goel-Stevens, I was offered the opportunity to have a short cameo appearance in the production. Each of the three of us jumped at the opportunity to be involved with the cast of students who were performing. Our role was considered a 'cameo' for good reason. It was small, consisted of no more than a couple of lines and didn't require dressing in costume. Being on stage and having a spotlight shone on me for a short moment was exciting. Hearing the laughs from the audience as I walked on to the stage twas a unique experience. I was happy that I remembered my lines and that I didn't trip and fall flat on my face. It was also nice to hear a few claps as I exited. But, what really struck me was during the intermission, in the minutes that led up to my entrance. As I waited back stage, adrenalin pumping and anxious to get on stage, I watched the students. Some moved props, some changed into different costumes and others were preparing the lighting and sound. Students were moving around in all different directions carrying out their responsibilities. It was organized, well-coordinated and was obviously well-practiced. But, what struck me more than anything else, was the number of students who came up to me, offered me their support and said 'Break a leg!' These short words of support, although humorous in nature, made me feel like I belonged to the family of students involved in the production. And so, this is the main point that I will take away from my experience. The nearly 70 students who worked together for the past five months had formed a bond with each other and become their own extended family. Each student, regardless of his or her role, felt a sense of belonging and took pride in completing his or her role to the best of his or her ability. This sense of belonging and connectedness with the school has far-reaching benefits beyond the scope of the show. These students carry themselves with a sense of confidence and are more invested in their education. As I watched the remainder of the show, I found my self being blown away by our talented student actors and actresses. In many cases this was the first time I had seen them in this environment. And thrive in this environment, they did! They displayed a level of passion and enthusiasm that is only seen when students are truly engaged in what they are doing. So, as we approach our work with our students, we must remember that each and every one of our students possesses his or her own talents. The challenge for all of us is to provide them the stage on which they can shine! Thanks for writing this. Your thoughts eloquently describe my own observations and feelings about the production. Wouldn't it be amazing if every student had the opportunity to feel what it was like to be a part of a wildly successful production, project, or team? 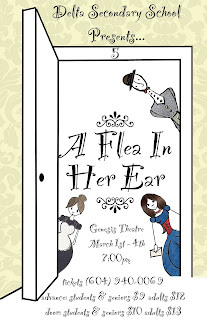 Congratulations to the cast and crew of "A Flea in Her Ear", and to Rebecca and Mark for their inspiring leadership and direction. Kudos to the staff who worked behind the scenes to make the production run so smoothly. Thanks to all for demonstrating what can be achieved through teamwork and commitment. And while the performances were outstanding, what will stick in my mind was the feeling that every person, no matter their role, was integral to the whole. Pretty powerful. Congratulations on what sounds like a great production! The other thing that we need to recognize from these types of experiences is that the nerves and adrenaline that we feel prior to things like this (I was recently called on stage in front of our kids during a comedy presentation) are the very same ones that our kids feel when they put on these shows. They deserve a great deal of credit for having the guts to lay it all out there in front of their peers, especially considering that they are on for more than the 15 seconds that we are!